We have extensive experience of leading successful change projects, and we help our clients’ staff in applying the same insights and disciplines. 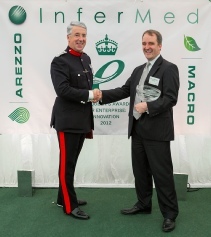 Our client receives the Queen’s Award for Enterprise in Innovation from Colonel Stephen Foakes, Deputy Lieutenant, for the NHS website. When clinical software supplier InferMed Ltd won the prime contract for the NHS’s hi-tech new website, they asked Andrew Wright to lead the project. Delivery target was just 6 months, half the time originally planned, and the people involved were spread geographically, with complex cultural and commercial relationships. Delivery is really about people – in this case we forged a single team across all stakeholder groups and locations then motivated people to deliver very effectively.